Canadian carrier WestJet has had a special Scottish tartan designed to mark its forthcoming launch of transatlantic flights to Scotland and has applied decals of the tartan to the tails of two Boeing 737-700s. To mark the occasion of its first service to the United Kingdom, WestJet worked with the world’s last dedicated hand-crafted tartan mill, D.C. Dalgliesh of Selkirk in Scotland, to design a commemorative tartan in the airline’s blue-and-teal corporate colors. WestJet will launch service from Halifax in Nova Scotia, to Glasgow, Scotland’s largest city, using one of the two Boeing 737-700 jets whose tails are adorned with the custom-designed WestJet tartan. In addition to decaling the tails of the two aircraft with the specially designed tartan, WestJet has produced neck ties, cufflinks and scarves which feature its pattern. “We wanted to create something unique to celebrate our new service to Scotland and what could be more Scottish than creating our own company tartan?” asked Lindsay Robertson, WestJet’s lead, creative services. 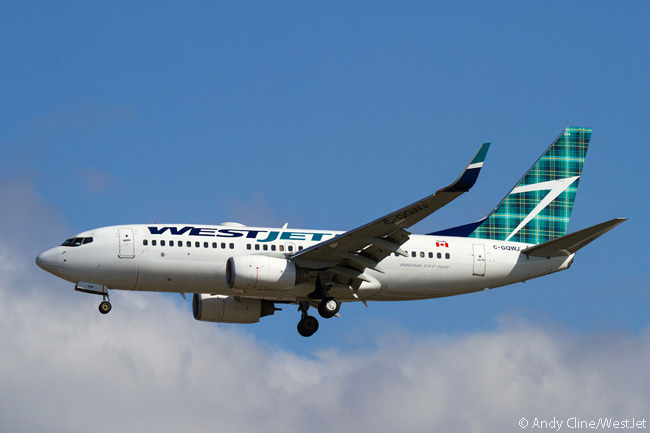 WestJet’s first flight from Halifax to Glasgow departs Halifax Stanfield International Airport at 10:45 p.m. on Friday, May 29. The daily, non-stop seasonal service runs until October 24. Calgary-based WestJet launched its first transatlantic service in June 2014 between St. John’s in Newfoundland, and Dublin, Ireland’s capital city. The daily, non-stop seasonal service resumed on May 1 this year, six weeks earlier than last year. It concludes on October 23.